The existence of the particle was theorized in 1964 by the British physicist Peter Higgs to explain why matter has mass. Scientists believe the particle acts like molasses or snow: When other tiny basic building blocks pass through it, they stick together, slow down and form atoms. Scientists at CERN, the Geneva-based European Organization for Nuclear Research, announced in July 2012 that they had found something that looked like the Higgs boson, but they weren’t certain, and they needed to go through the data and rule out the possibility it wasn’t something else. On Thursday 14 March 2013 , they said they believe they had got it right. “To me it is clear that we are dealing with a Higgs boson, though we still have a long way to go to know what kind of Higgs boson it is,” said Joe Incandela, a physicist who heads one of the two main teams at CERN, each involving about 3,000 scientists. Whether or not it was a Higgs boson had to be demonstrated by how it interacts with other particles and its quantum properties, CERN said. The data “strongly indicates that it is a Higgs boson,” it said. The discovery explains what once seemed unexplainable and still is a bit hard for the average person to comprehend. But it means the key theory that scientists use to explain everything works — for now, at least. Its discovery could be a strong contender for the Nobel, though it is uncertain whether the prize would go to the 83-year-old Peter Higgs and the others who first proposed the theory, or to the thousands of scientists who found it, or to all of them. Finding it wasn’t easy. It took more than two decades, thousands of scientists and mountains of data from trillions of colliding protons. And it needed the world’s biggest atom smasher — CERN’s Large Hadron Collider, which cost $10 billion to build and run in a 17-mile (27-kilometer) tunnel beneath the Swiss-French border — to produce the extreme surge of energies simulating those 1 trillionth to 2 trillionths of a second after the Big Bang. 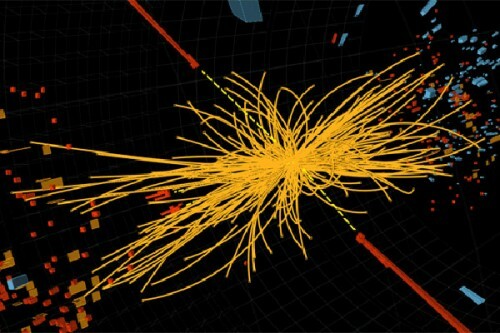 The Higgs boson is so elusive that only about one collision per trillion will produce one of them in the collider. CERN said it is open question whether this is the Higgs boson that was expected in the original formulation, or the lightest of several Higgses predicted in some theories that go beyond that model. “We found a new particle and we want to know how it behaves, and maybe it behaves the way it was predicted in 1964, maybe it’s a little bit different,” said physicist Sean Carroll of the California Institute of Technology, who isn’t involved in the research. Finding a Higgs more or less as expected is actually a bit deflating, Carroll said, because physicists had also hoped that an unexpected type of Higgs might open windows into yet more mysteries of the universe. Some of the remaining mysteries including why gravity is so weak and what is the dark matter that is believed to make up a large part of the total mass in the universe, said Patty McBride, who heads a center at the Fermilab in Chicago. On finding the “God particle”….